Because life is short, I think a lot of us hope that we will be remembered by the ones we love. The idea that we have a sort of immortality by those whose lives impact our own and the lives we impact gives our own lives a sense of meaning. I used to volunteer at an assisted living center when I was in college. I would visit one woman in particular. Every visit she'd tell me the same stories from her childhood, the ones that must have shaped who she was as a person more than any other. I only got rare glimpses of her adult life when her sister visited, but her childhood felt as real to me as any story I'd read, really. I still think of her from time to time, she passed on her memories to me, so as long as I live, in a way she lives, too. This is how we achieve a measure of immortality. What if you could save people and give a great gift to the world, but the cost would be that everyone you loved would forget you? This is the question at the heart of A Need So Beautiful and this conflict is what made this book interesting to me. The idea that we'll be remembered by the people that we love is something we take for granted, but Charlotte is one of The Forgotten. She gets attacks that won't subside unless she completes a mission of helping people. I suppose in a way she's like an angel, but I this is an invented mythology. There's no God, just The Forgotten, Seers (the only people who remember The Forgotten) and Shadows--the Forgotten who have chosen not to fulfill their destiny. 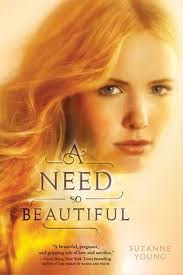 I won't go into too much more detail but A Need So Beautiful is a very readable book about a girl with the weight of the world on her shoulders. It's about sacrifice and doing the right thing and love. And while I thought Harlin (her boyfriend) was a touch too perfect, and some of the transformation she underwent a bit gross, I enjoyed reading this book and contemplating the importance of memory and creating memories and living in the present while reading this book. A YA paranormal with an interesting premise that helps it stand out a bit from the crowd.